EasyDiscuss 4 is a paid component, in which you will need to buy the component prior installing it on your site. In this section, we will guide you How To Download EasyDiscuss 4 by purchasing step by step. Go to our Official Website http://stackideas.com. Navigate to Products > EasyDiscuss > Pricing. Here, there will be a list of subscription plan for EasyDiscuss 4. You will have to select the desired plan by clicking Buy Now button at the bottom of the plan. Next, double check the selected product. Choose the payment method. There are 4 types of payment method; Credit Card, PayPal, Amazon and Wire Transfer. 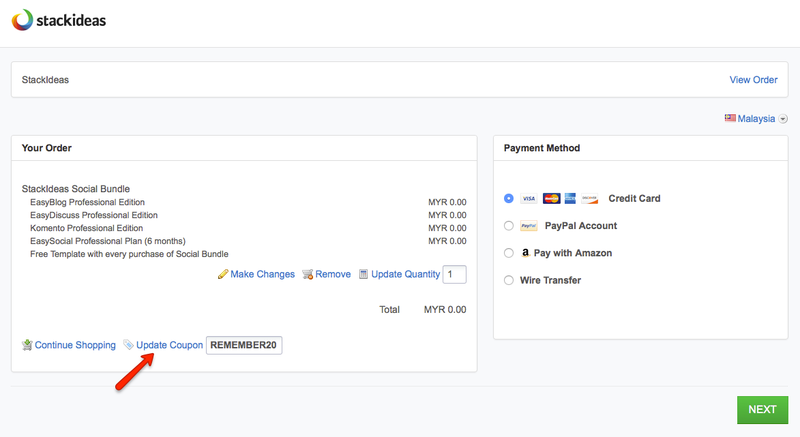 Once you have confirmed the payment method, click on Next button to complete the purchasing. A thank you page will appear once the payment process is successful. StackIdeas occasionally offer discounts on our products and we constantly having campaign with our partners. In this section, we will guide you Purchasing EasyDiscuss 4 With Coupon Code step by step. Key in the coupon code which you have acquired before and remember to click Update Coupon button to activate the coupon code. Next, choose the payment method. There are 4 types of payment method; Credit Card, PayPal, Amazon and Wire Transfer. When a purchasing process is done, you will received an email for confirmation. If for some reasons, you do not received it, please contact us on our Priority Forums and we will assist you from there. Go to http://stackideas.com and Sign In to your profile. Navigate to http://stackideas.com/dashboard to download EasyDiscuss 4 components. Here, you will see the list of purchased components. Locate EasyDiscuss 4 installer and download it to your desktop. Learn more about EasyDiscuss 4 on this Getting Started Guides which will walk you through your first EasyDiscuss 4 installation, and show off the basic of the major features EasyDiscuss 4 has to offer.